My December goal for A Lovely Year of Finishes has been met. 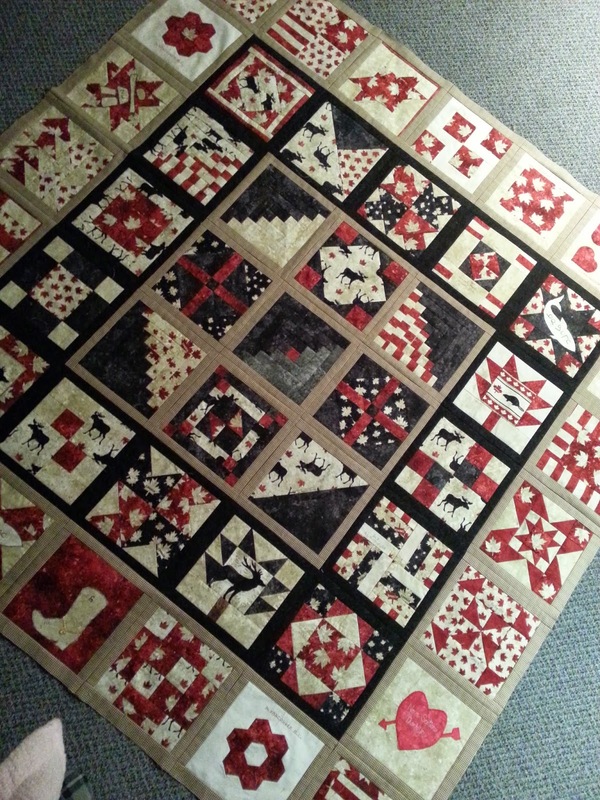 The Quilt of Valour flimsy I've been working on is finished!!! 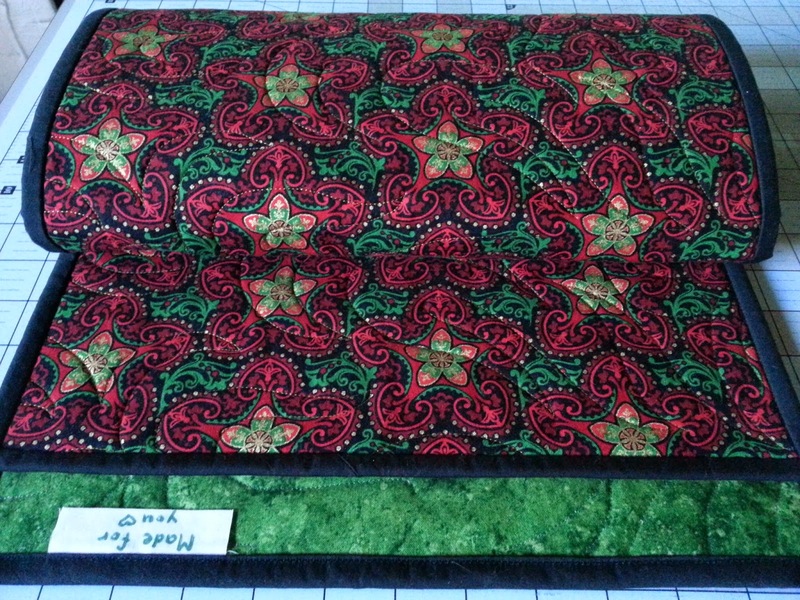 I've prepared a backing using a print that reminds me of poppies. 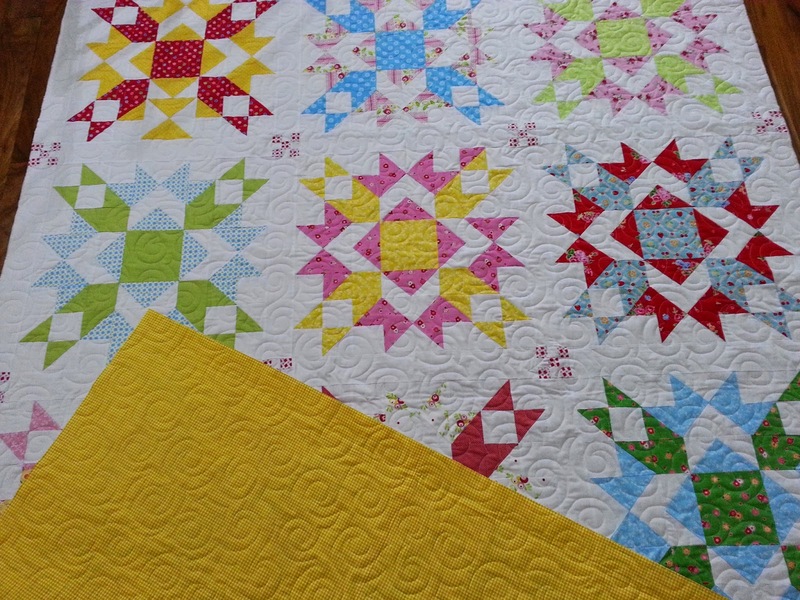 It's been in my stash for years waiting for just the right quilt, and I think it works here. There was just enough fabric to make a pillowcase, too. 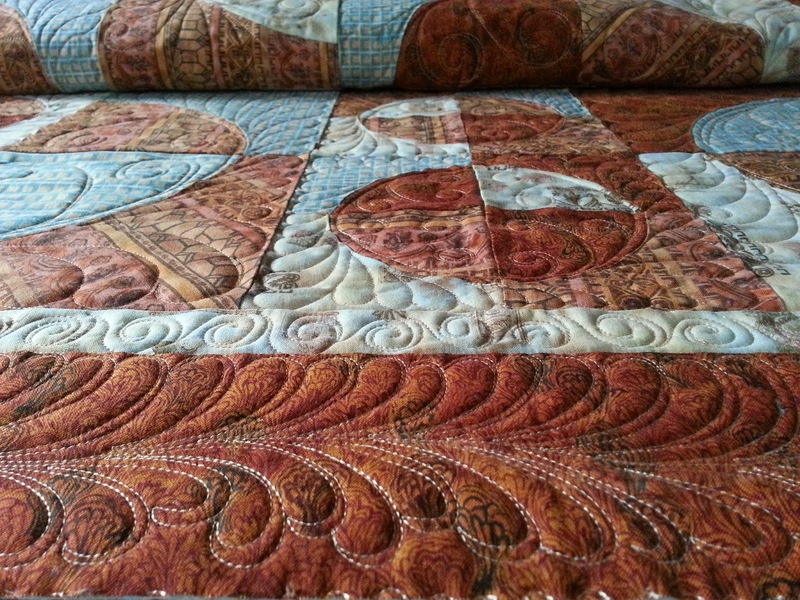 Now I can't wait to get this quilted, bound, and ready to give away! I'm so happy that ALYoF will carry on for another year! I plan to continue linking up with Melissa and Shanna each month, setting and working toward goals. What about you? Will you join in, too? It's very motivating, and lots of fun to see what everyone else is doing! 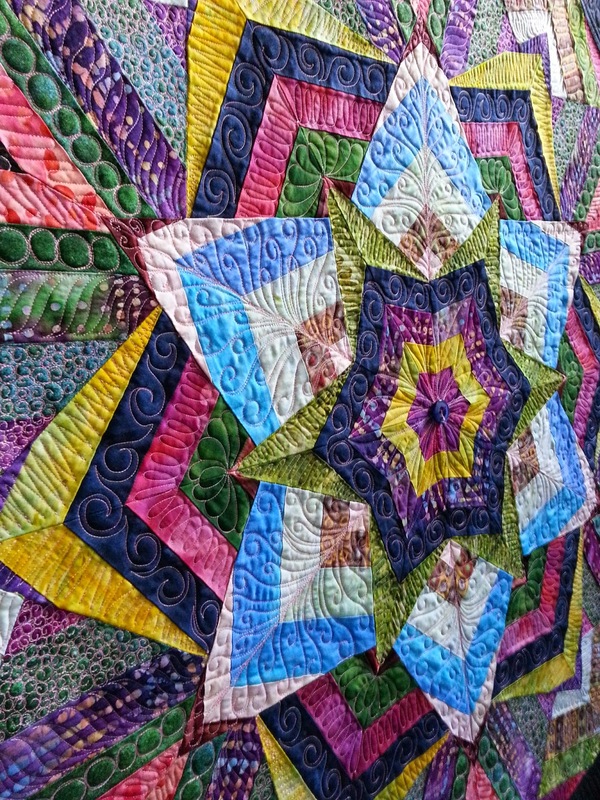 Remember the quilt that was on the frame before Christmas? It's done...and so is its twin! I was all caught up by the 22nd, so have been enjoying my holiday guilt free. 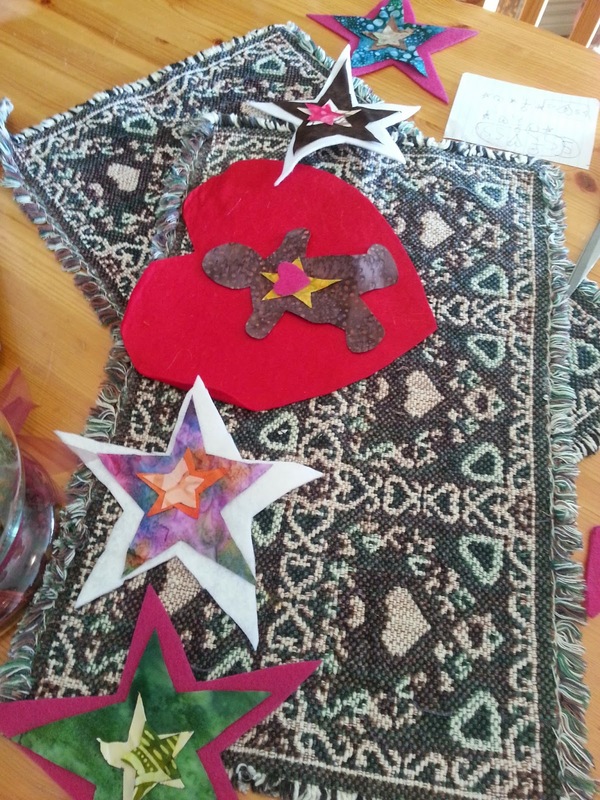 In fact, last week I had a whole, uninterrupted, glorious day in my sewing room! 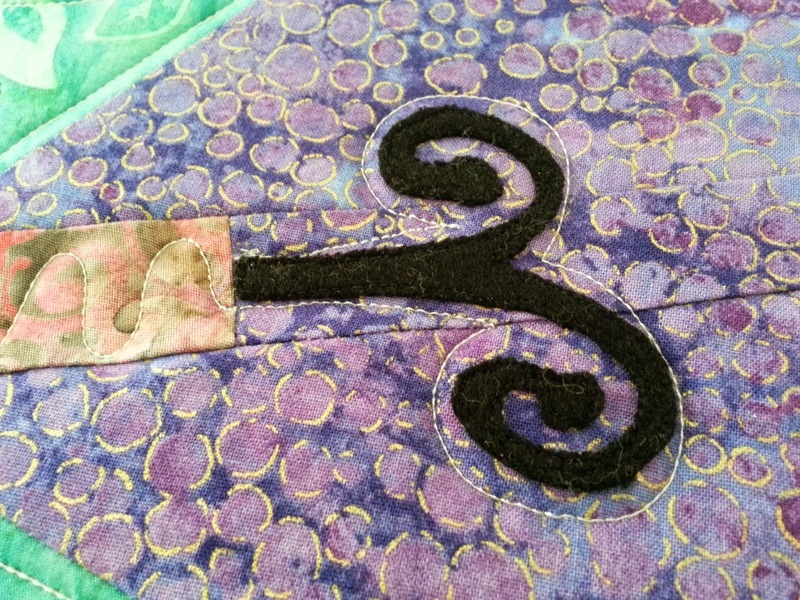 I read, tidied and organized, stitched a postcard, cut border fabric for the QofV top (now finished), and daydreamed. It was fabulous. I want more of that!!! 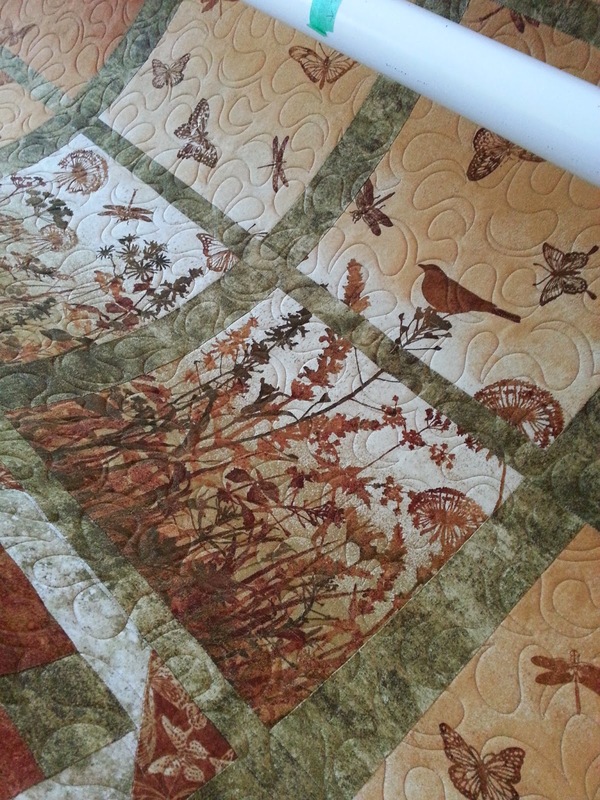 Plan regular times for "dreaming and doing" by settling into my sewing room without a particular agenda. 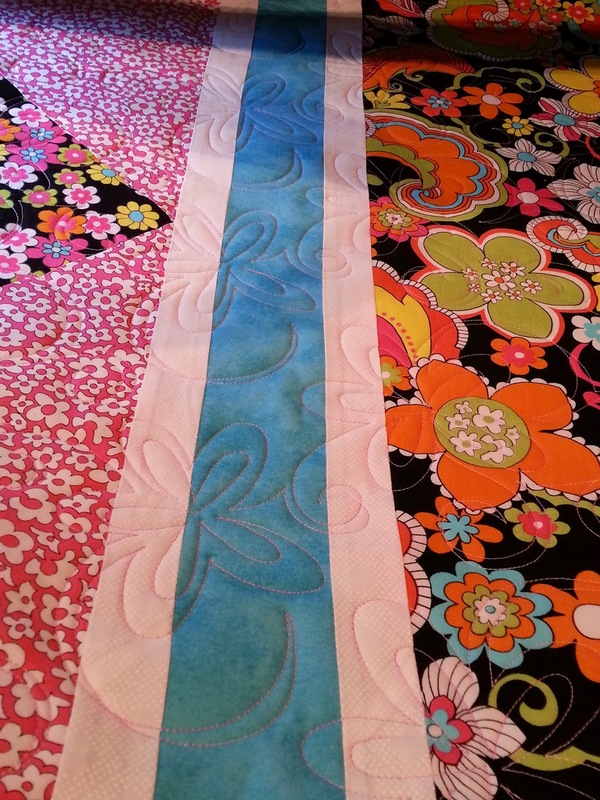 Practice morning yoga to keep my neck, shoulders and knees in good shape for long hours at the quilting frame. Take better advantage of online subscriptions by accessing them more often. When life gets busy this is one of the first activities I cut, BUT there always seems to be time for Facebook. Time to flip that around! 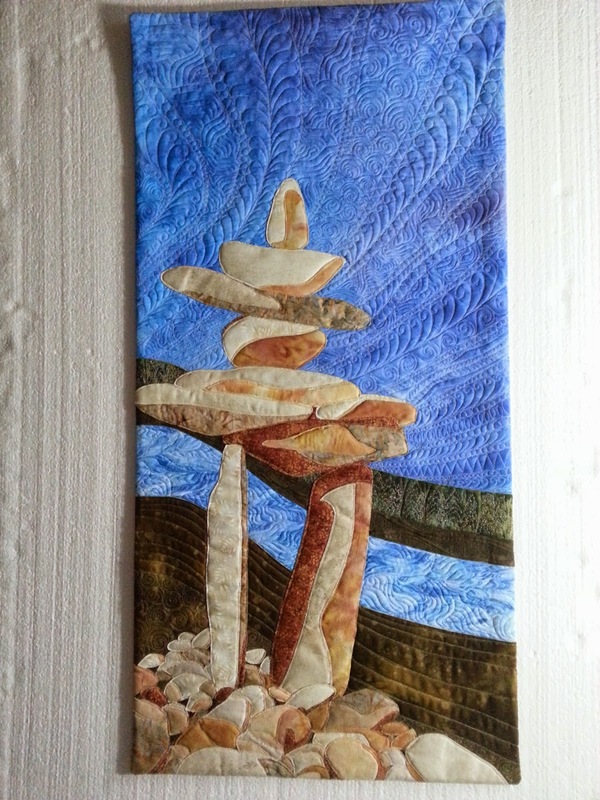 Submit a quilt to Quilt Canada. There, I've said it! Eeek! 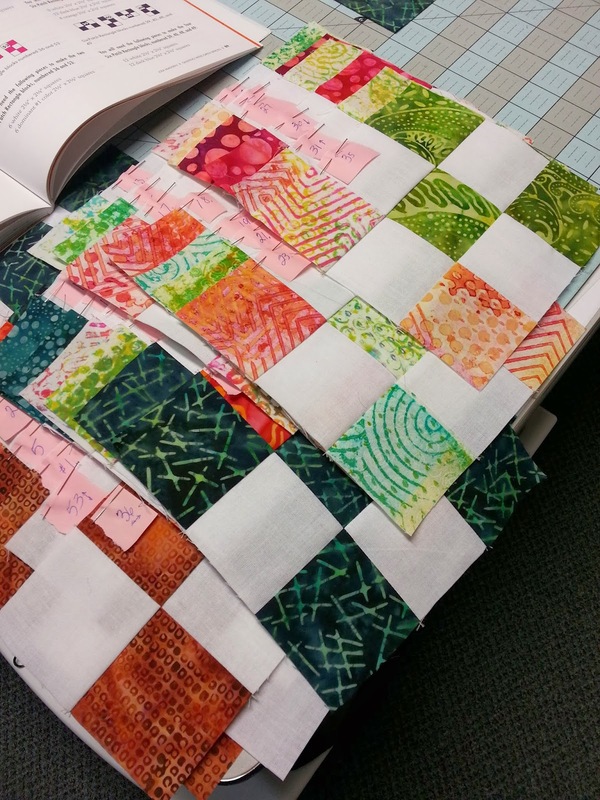 Dive in and take the first step toward becoming a certified quilt judge through CQA/ACC. Opportunity knocks, and I really want to open that door! 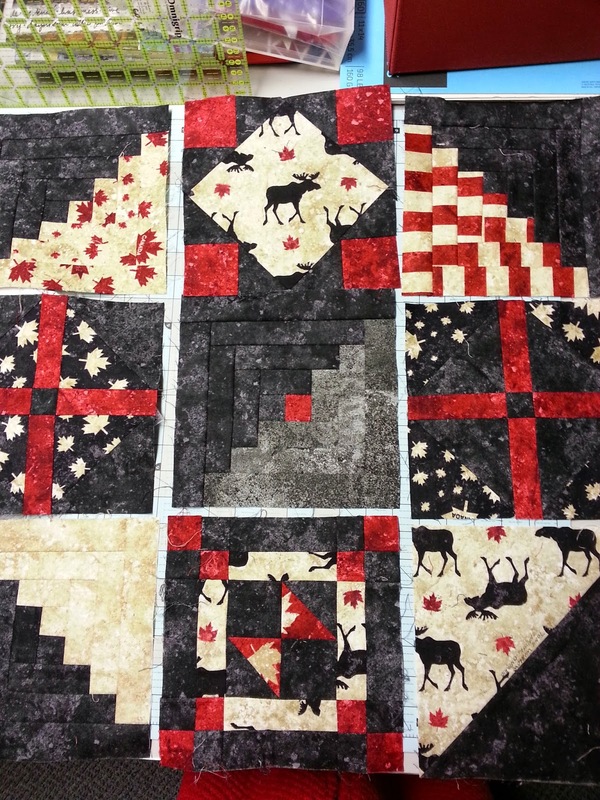 Participate in reader challenges offered through Quilting Arts magazine. 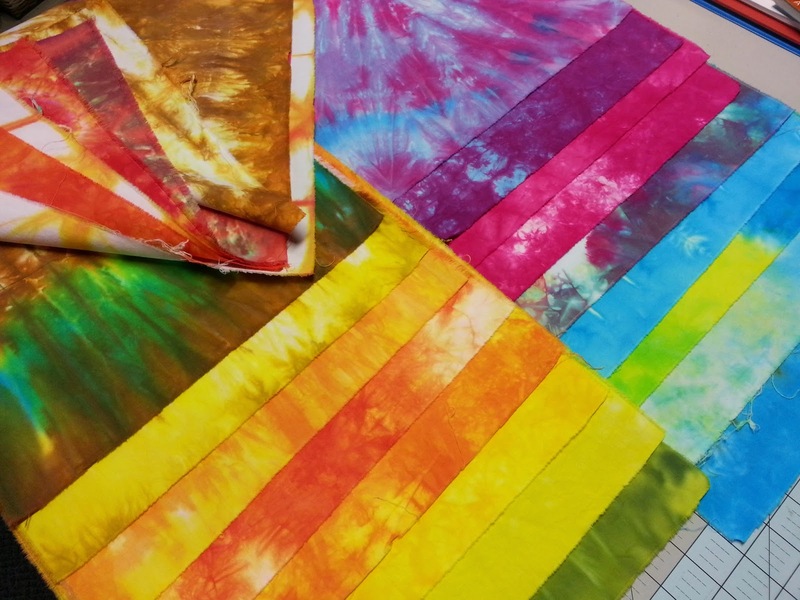 Participate in fiber art challenges offered by SAQA. 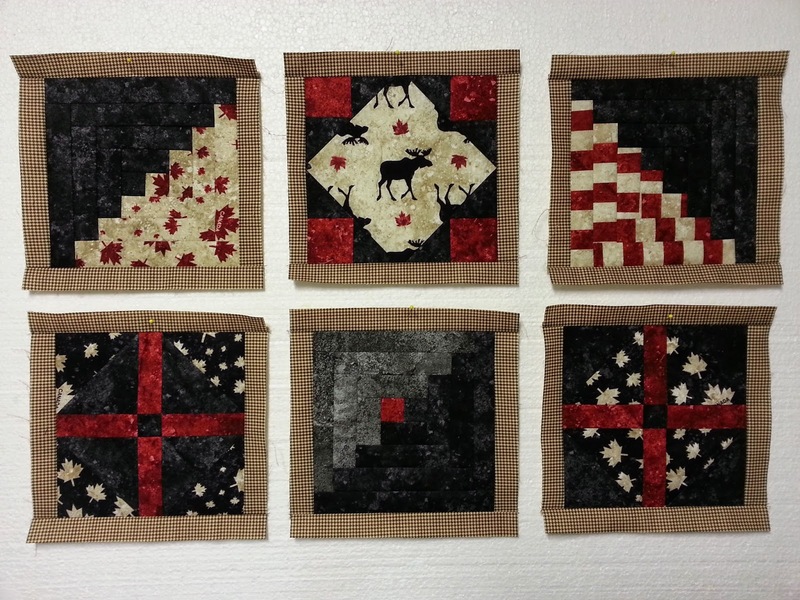 Go to Sisters, Oregon for "A Quilters Affair". Oh, my gosh! This will be visit number three! I had thought it would be a one time thing, but it is just so ding, dang wonderful that I want to go again and again! Do only the things that make my heart sing. There is no time for mediocre projects or experiences! Remember that not everything I make has to be perfect, or even all that good. It can just be an opportunity for growth. Take risks and allow experimentation. Elevate my skill level by practicing the things I learn from books, videos, classes, and my own experiments. Print this list and refer to it daily! Putting them out here for all to see doesn't hurt, either! Thanks, Yvonne, for encouraging this time of thought and focus. Now I shall snoop around and see what others are planning for 2015! 1. Dealing with a few thread tails. 2. 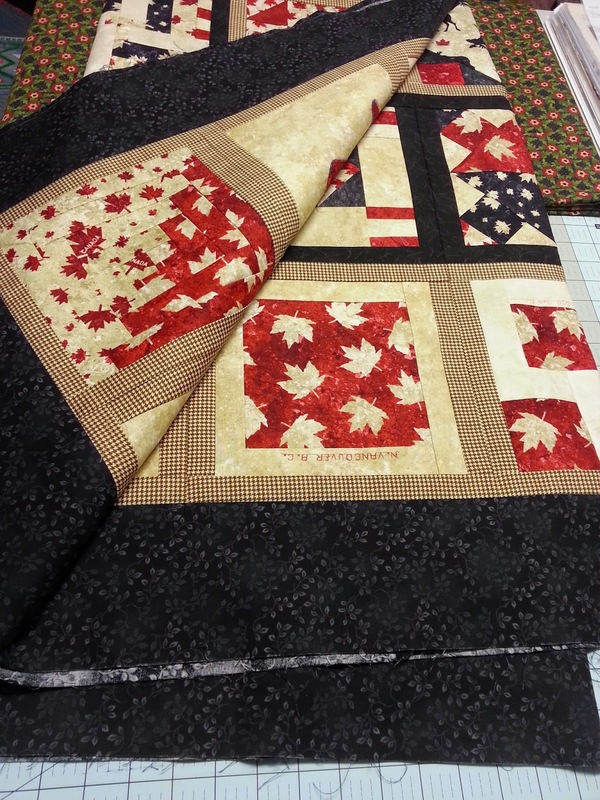 Quilt of Valour flimsy just needs final borders...and a decent photo op! 3. 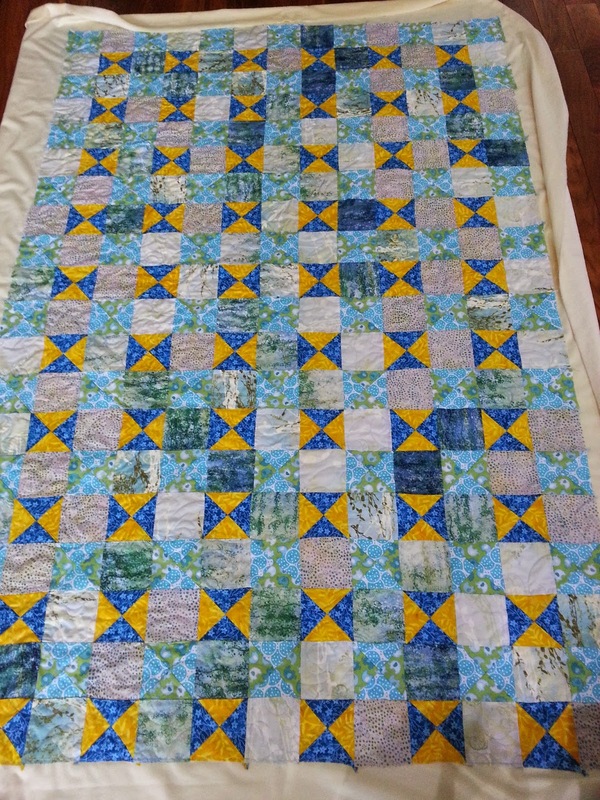 Another gorgeous client quilt, fresh off the frame! 5. 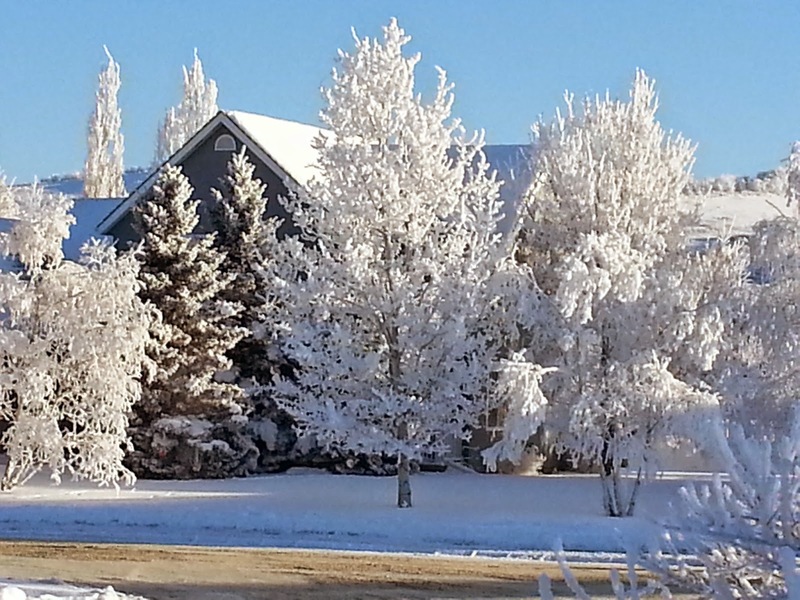 Spectacular hoar frost on a sunny day. View out my front door. 6. 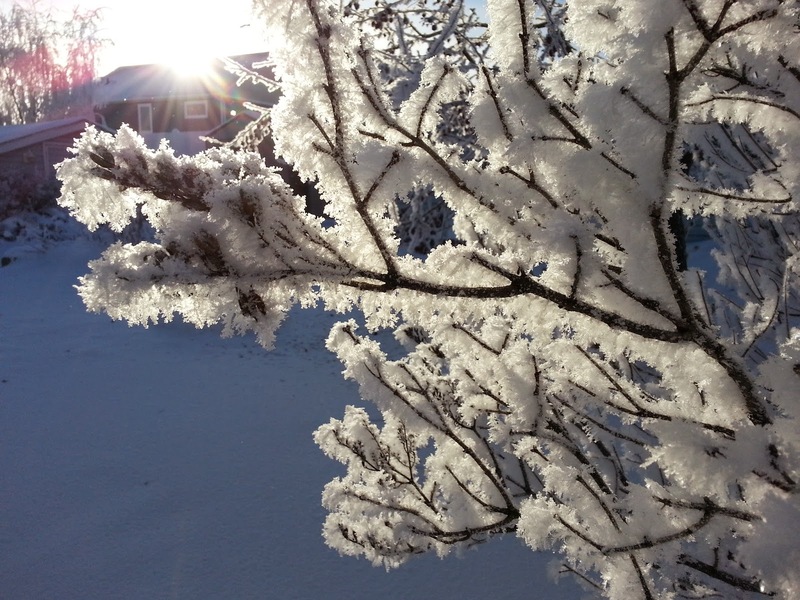 See how the ice crystals have built up on my lilac? 7. 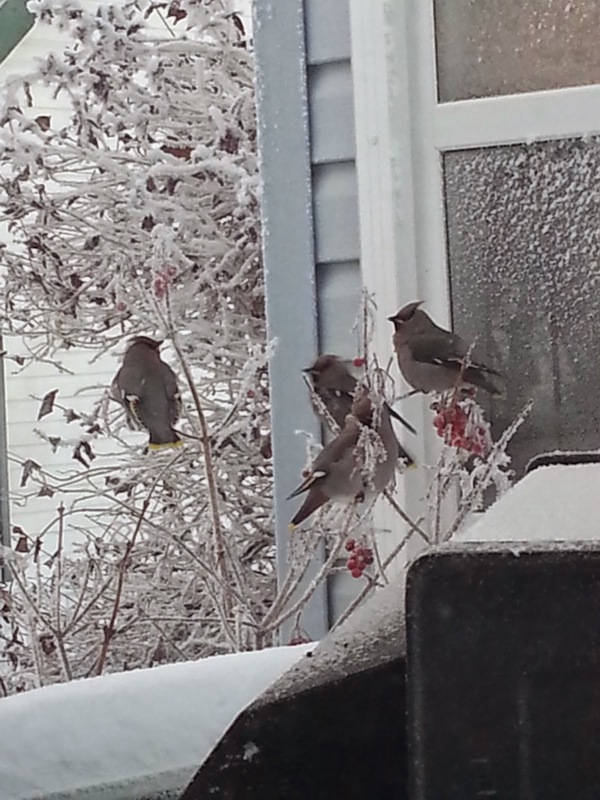 Cedar waxwings gobble highbush cranberries outside my kitchen window. 8. 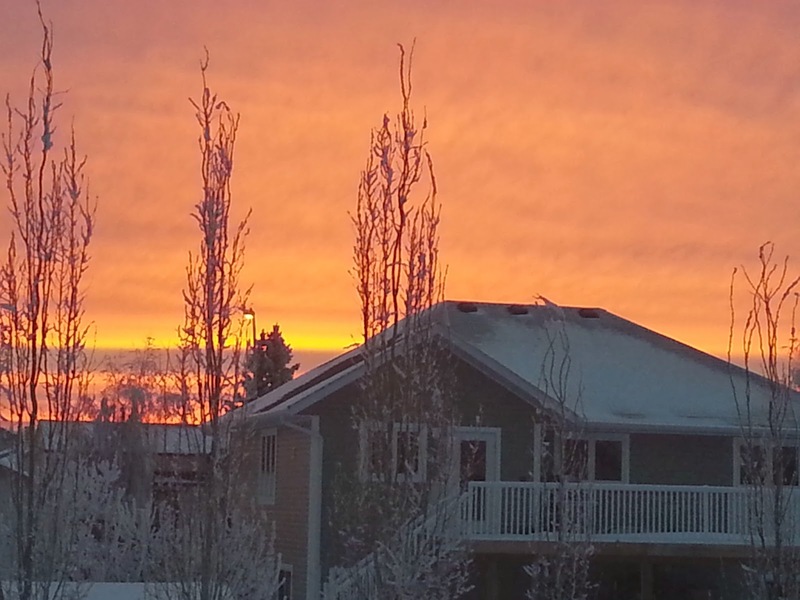 Sunset at 4:13 p.m. on December 19th...I've "zoomed" across my backyard toward the neighbour's house. 9. 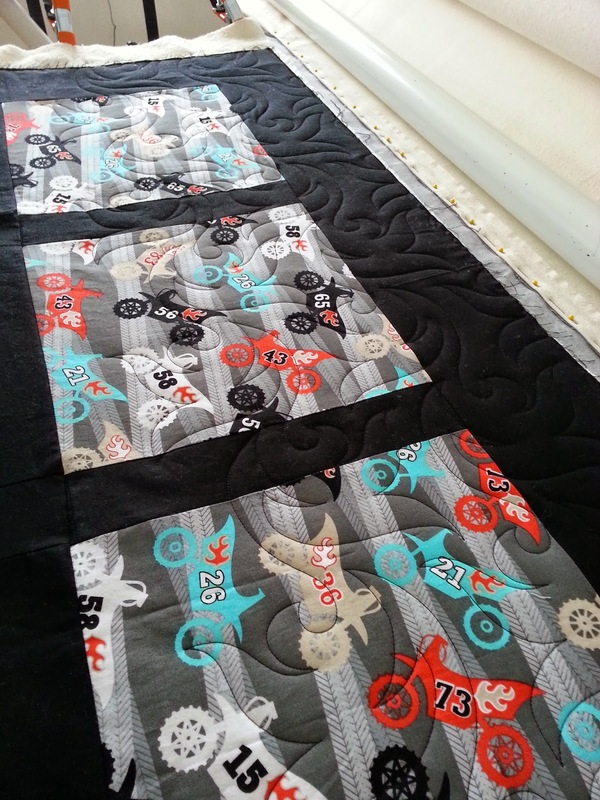 Another client quilt on the frame. 10. 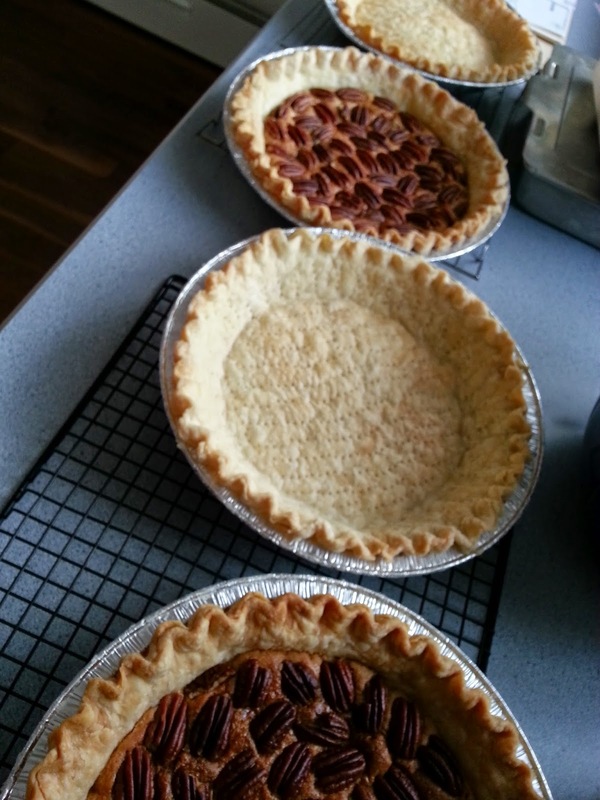 Pie baking day. Not for us, but to send to work for my husband to share. 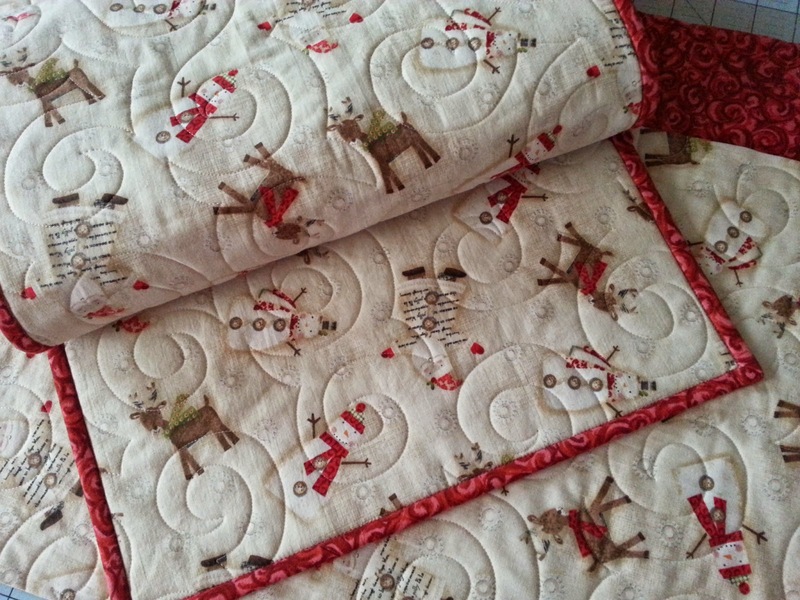 Next week looks just as busy, but will involve secret Christmas preparations and lots of family time instead of quilting. 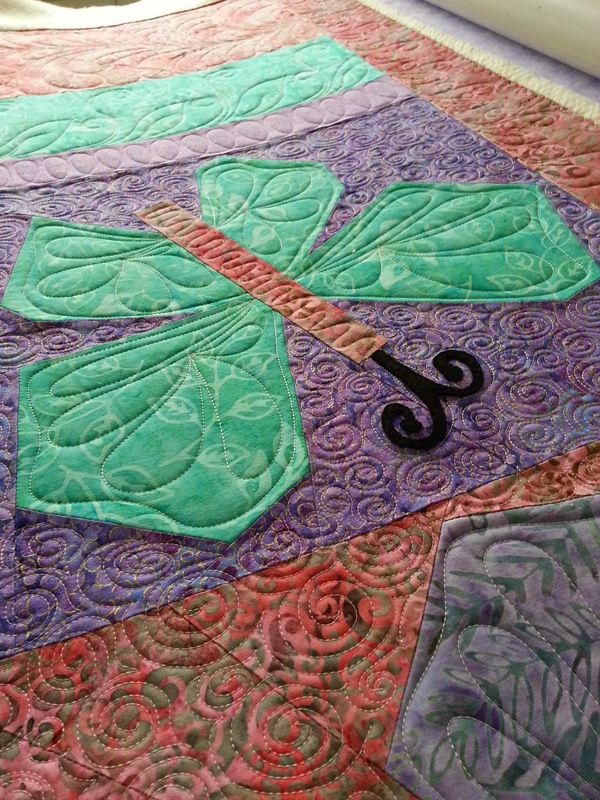 There will always be quilting! Ha! If you celebrate the season, have a wonderful, Merry Christmas! 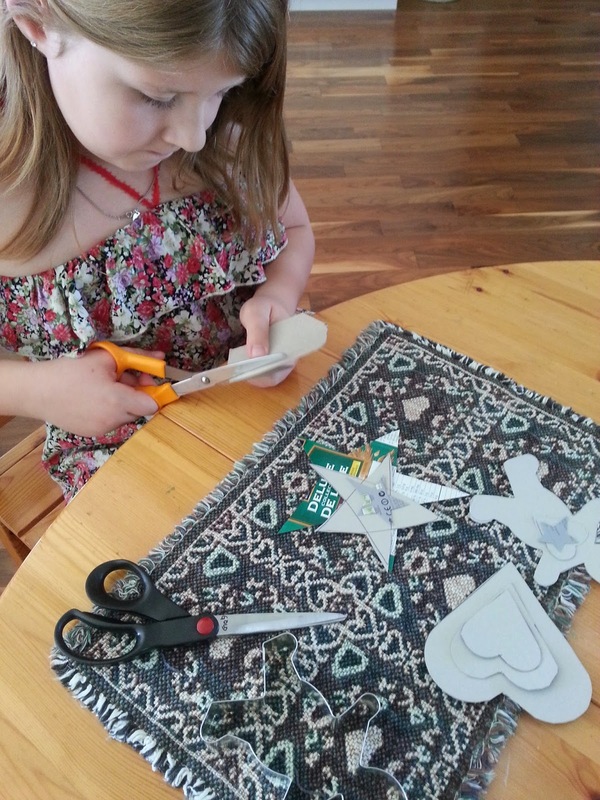 Certain little elves have been hard at work, making Christmas garlands. If you know these elves, please do not mention that you saw this post! They are super excited about this Christmas secret. I'd hate for them to accidentally spill the beans about who will receive their garlands. Spoiling the surprise would be so disappointing for them, and I would hate to be the cause! 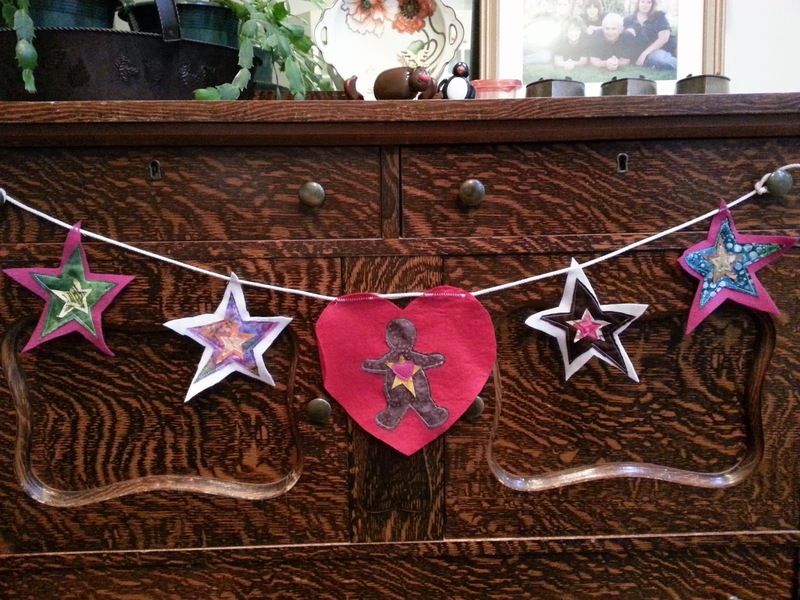 I loved the idea of making star garlands with my grandchildren, and happily the kids were enthusiastic, too! 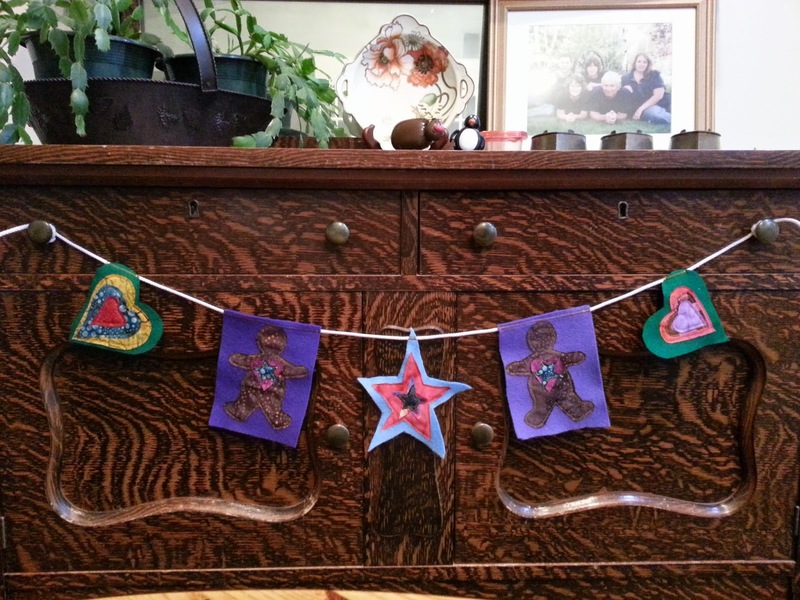 We decided to add hearts and gingerbread men to the mix. Yup. We like a challenge! 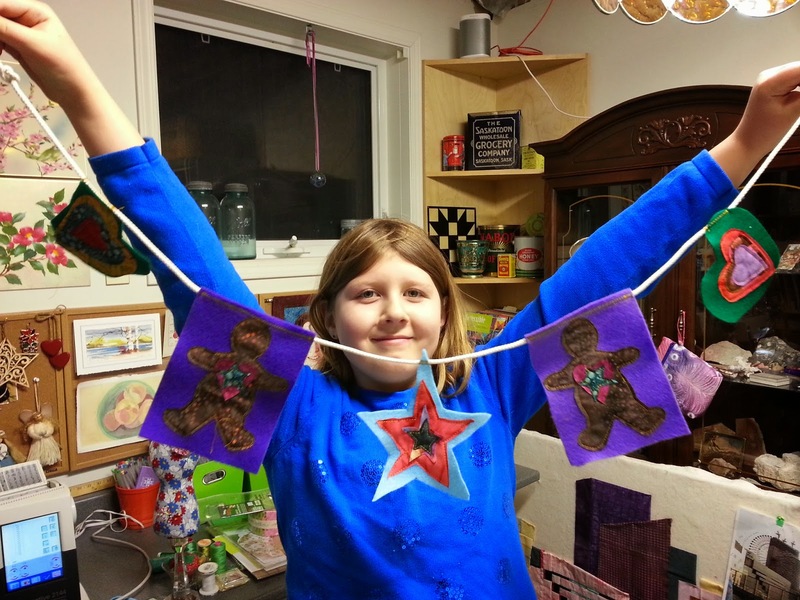 We hand drew the stars, but traced cookie cutters to make the other shapes. We made templates of all the shapes out of cardboard cereal boxes. I was impressed with the thought behind the design process. 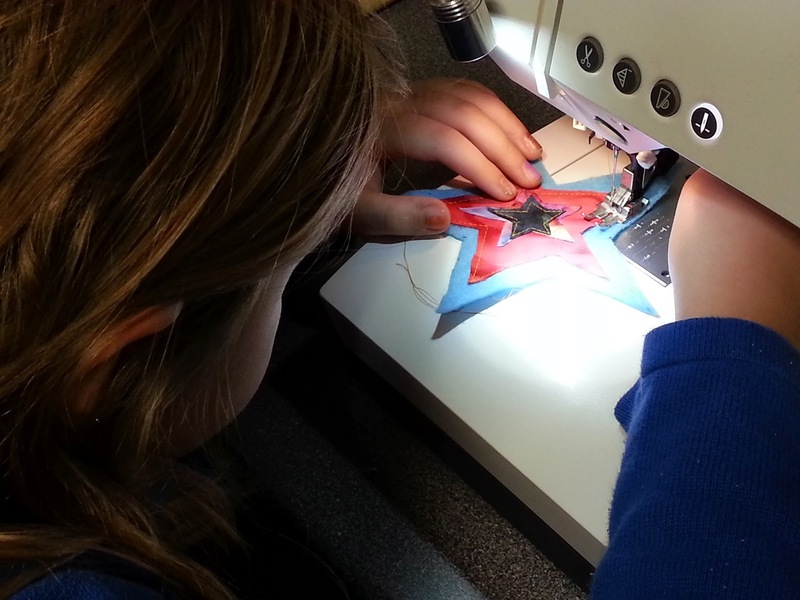 Each child had definite ideas about shape, colour, balance, and even the thread they would use to stitch everything together! Laina's garland, ready to stitch. 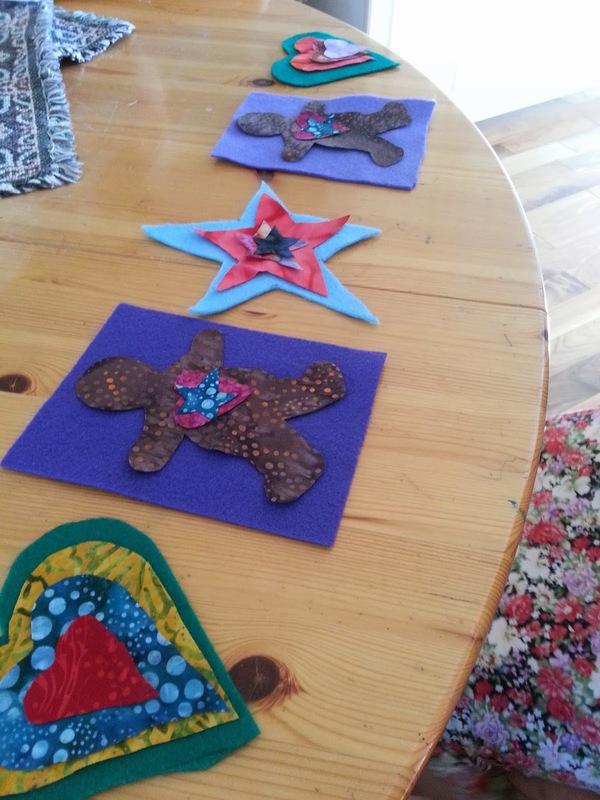 We used craft felt as the base for the shapes. 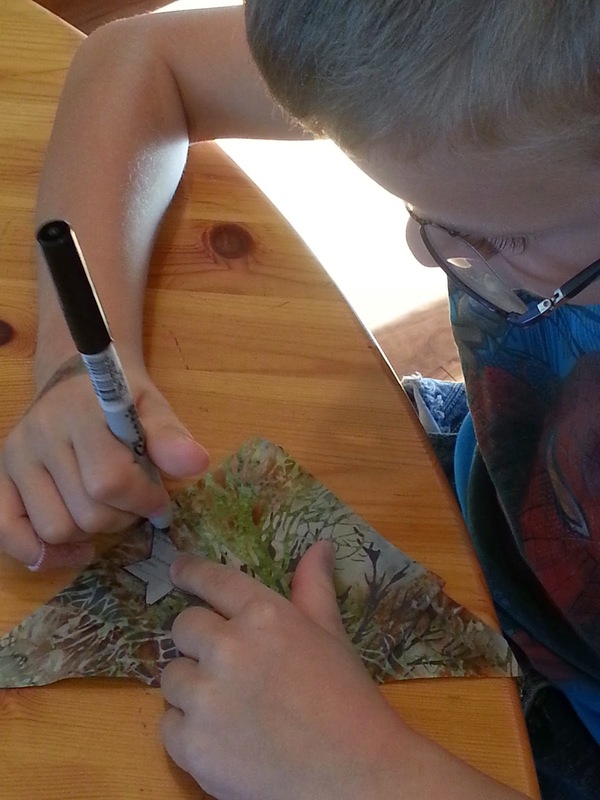 Cutting craft felt can be a bit tricky, so I helped Riley get smooth edges on his huge heart. As for the rest...a few signs that things are hand made just adds to their charm, in my opinion! 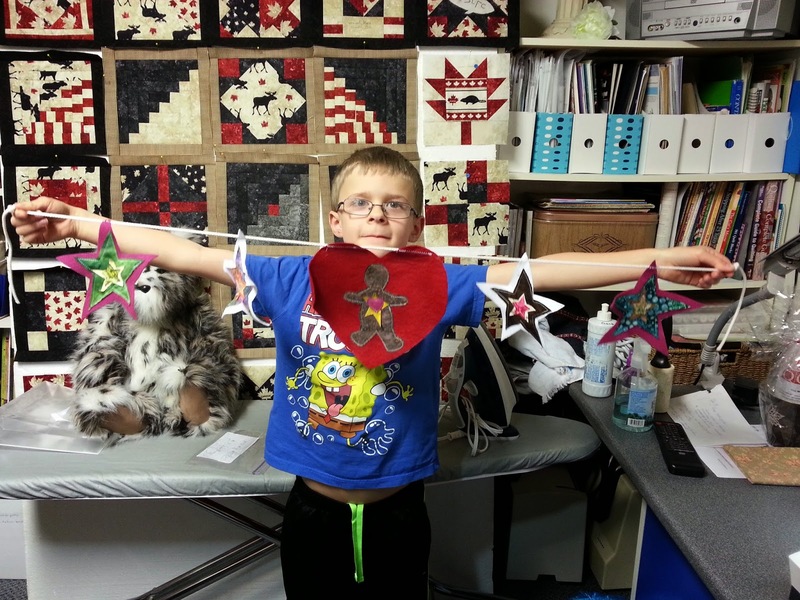 Thankfully, Riley (6 years old) chose mostly stars, so it was easier going for the cutting AND the sewing. 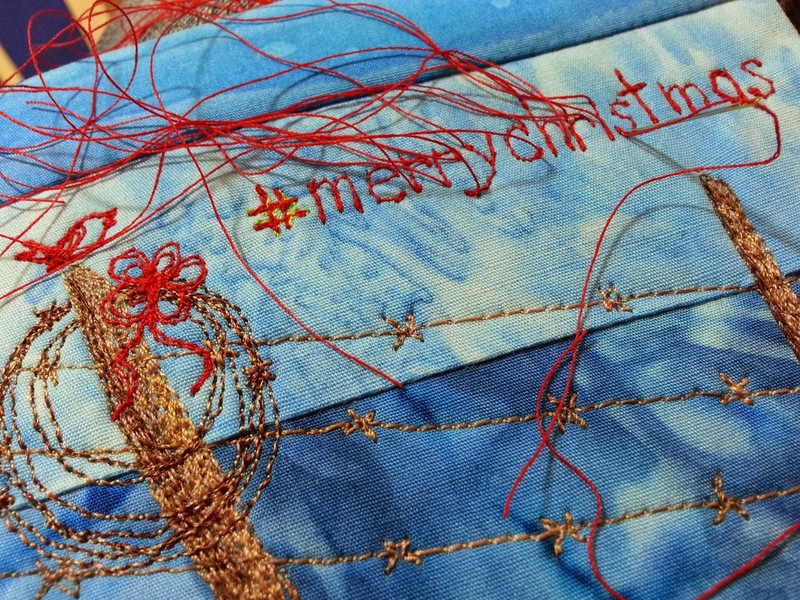 Riley's garland, ready to stitch. 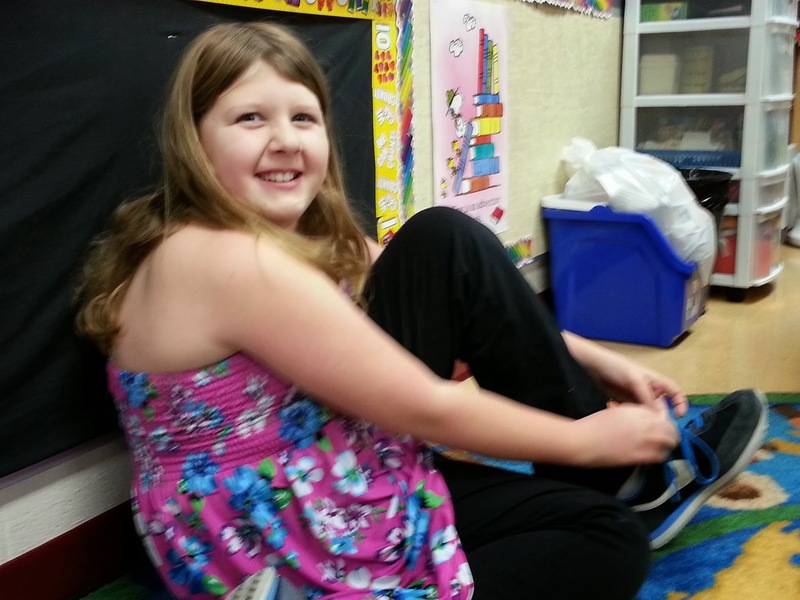 I don't have a picture of Riley sewing. He sat on the chair between my knees so I could operate the foot pedal of the machine and he could "drive". He did all the pivoting, steering, and reversing, but is a bit unpredictable, so I thought it would be safer for me to provide the "gas". Here he is, proud of his accomplishment! After this shot, I pressed the heart flat! Thanks for the inspiration, Sally! Three have been requested for Monday, so I finished these ones today to be sure they are ready. This deserves a happy, "WHOOP WHOOP!". 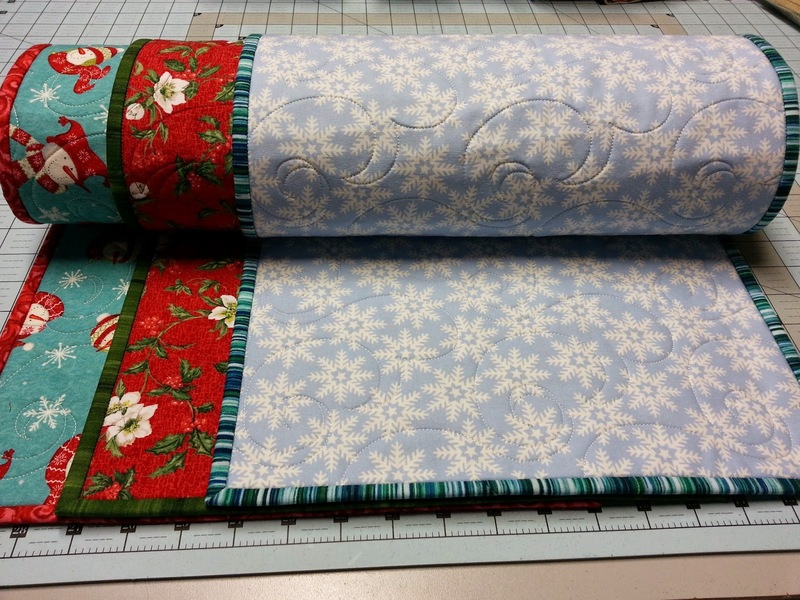 I'm extremely pleased with the way the table runners are turning out. Sometimes simple is best! 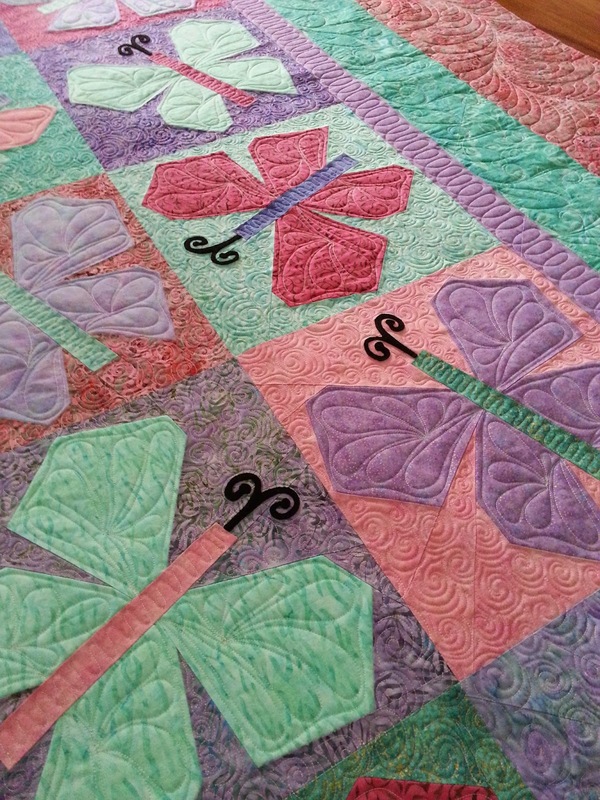 Well, no green grass around here at the moment, but there are butterflies, Fresh off the Frame! 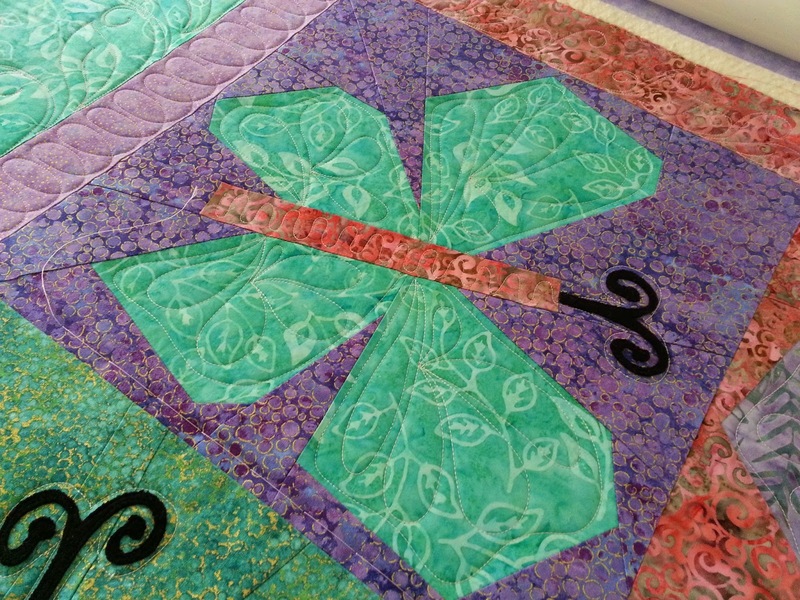 The butterfly filler was such fun to stitch! 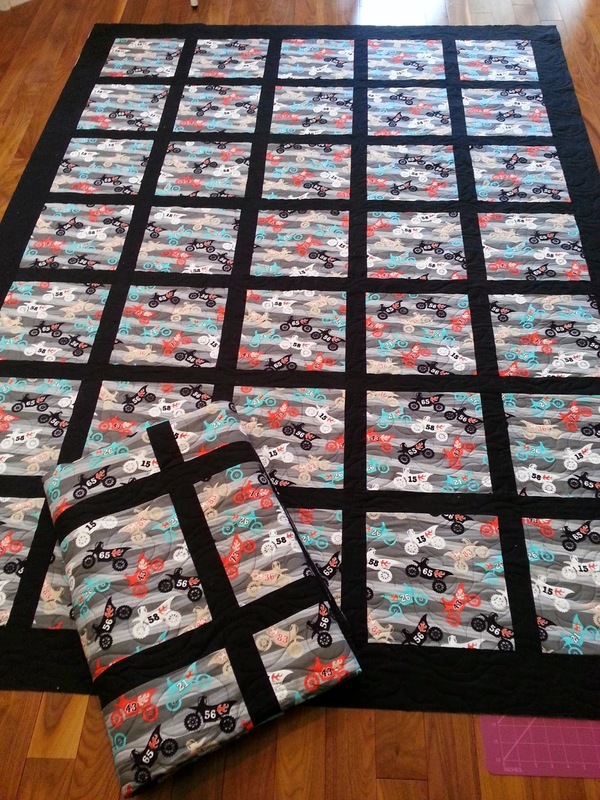 My client had requested the design shown in the Buggy Barn pattern book, which made things pretty easy for me. I just had to analyze the pictures and figure out a stitch path. I started each one by outlining its feelers and filling the body. Outlining the feelers and filling the body. At first I tried traveling in the ditch around the body as I worked the wings. I absolutely hated the thread build up. Sometimes a shortcut is not worth it, so each butterfly has five starts and stops (one for the feelers/body + one for each wing). Much better! 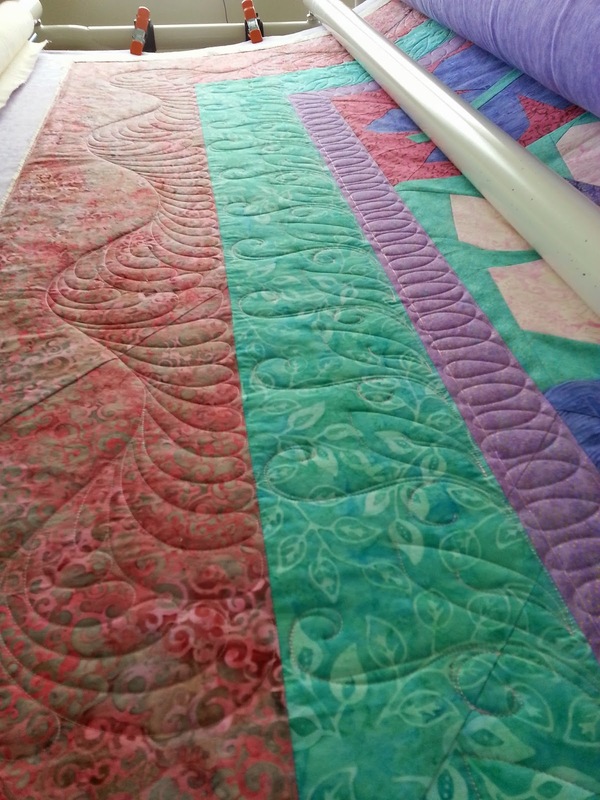 Before quilting anything, I had basted the entire quilt to keep things from shifting as I rolled it back and forth. I left the basting in place until the last possible moment. You can see it in the picture, below. I'd pulled it from the borders as they were filled, but it was still holding the row of blocks nice and square. 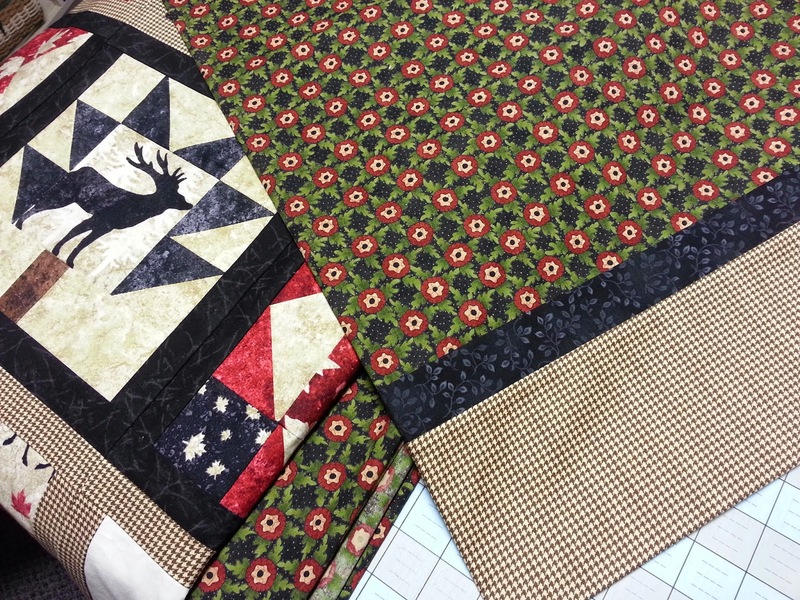 As I filled the blocks I pulled out the basting stitches. 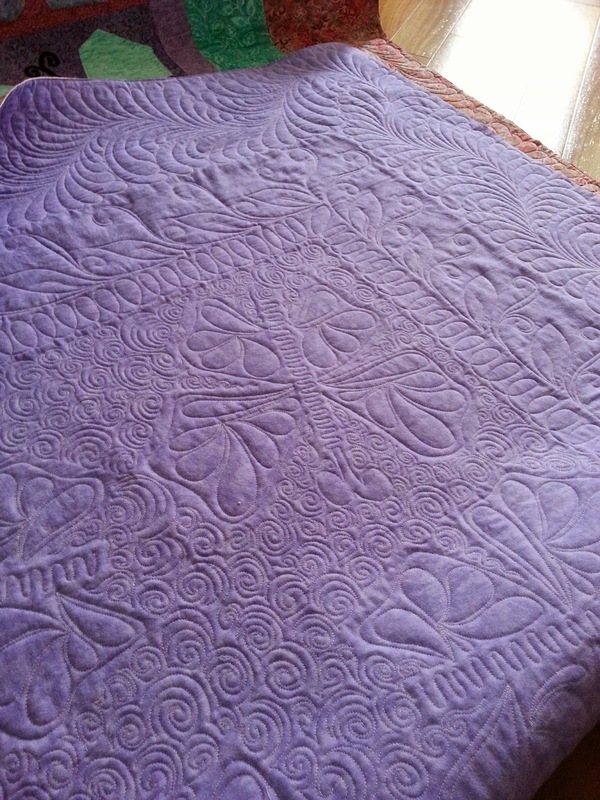 I must say...the last stitch was such a relief - I was swirling in my sleep by the time I'd filled all thirty blocks!!! Ah, but it was worth it. I love how it turned out, and so does my client! 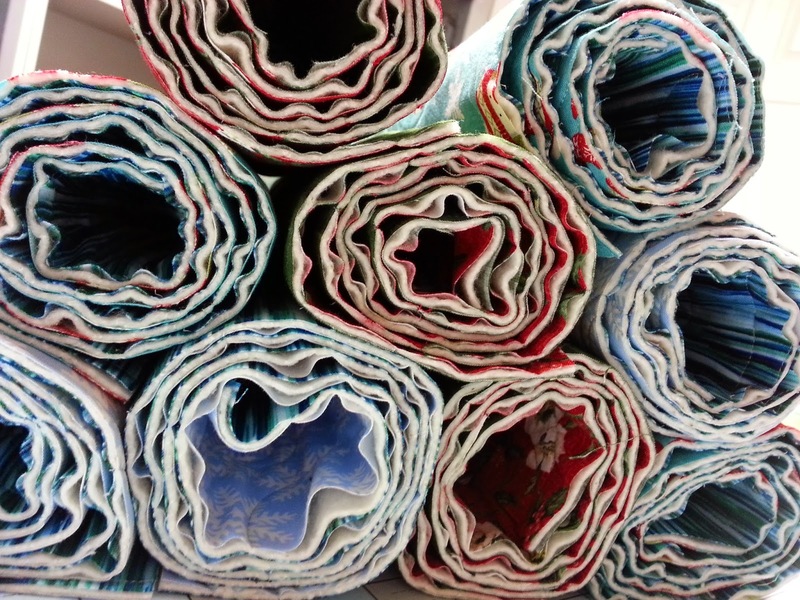 Don't you love seeing the texture on the back of a quilt? I sure do! Many different hands made these blocks, so naturally they vary in size. 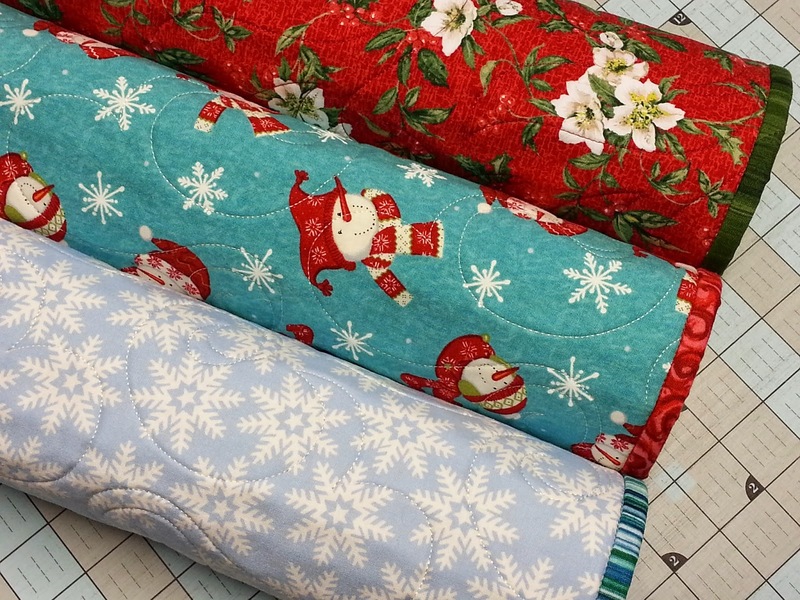 My first step has been to add fabric and square them up to make them all the same size. The center blocks feature quite a bit of black, so I've framed them with a herringbone print to lighten things up. The next round has been framed in black (Ha! I know...but it's the only thing I have that works! 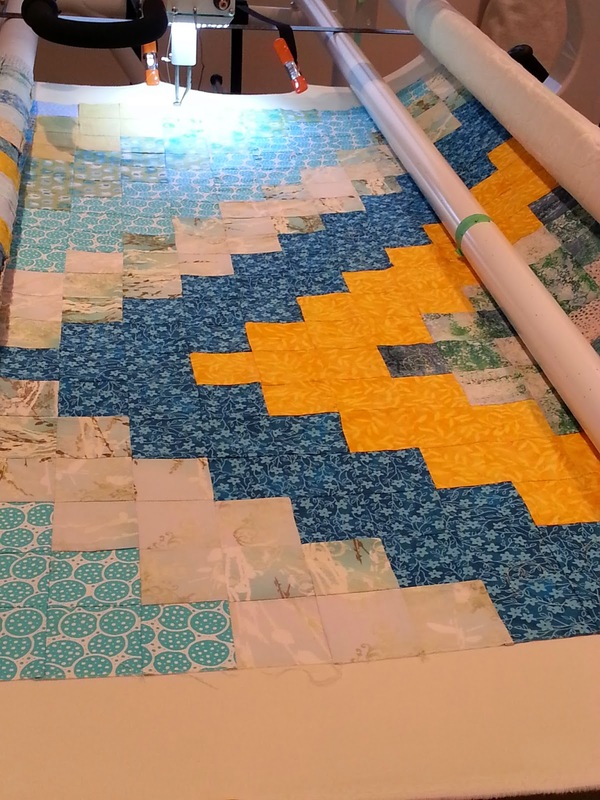 ), and I've used herringbone again for the final round of blocks (not shown). 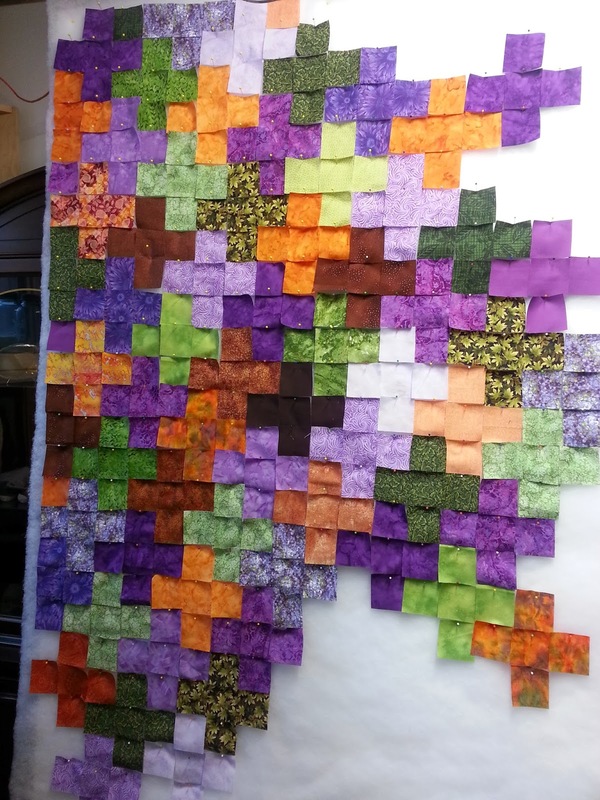 I plowed through a pile of framing and squaring on Saturday, chain piecing to speed things up. 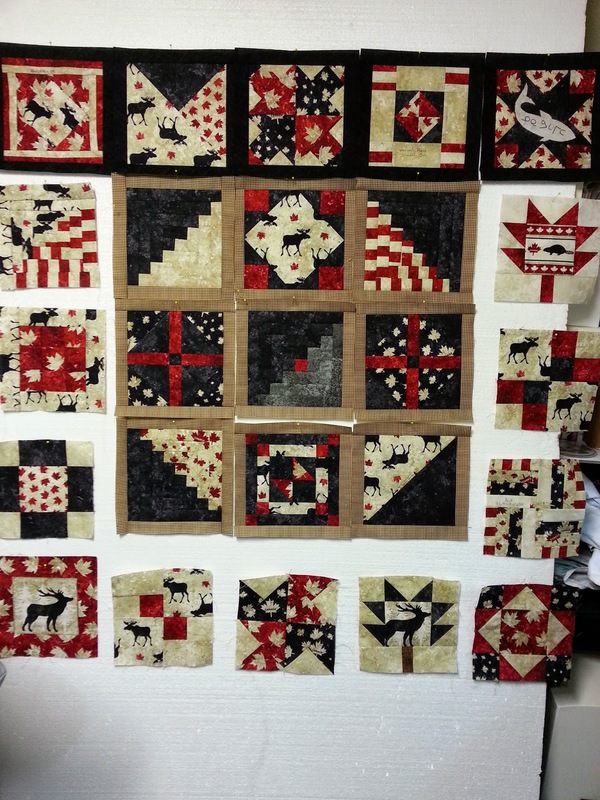 Twenty four blocks need their fourth side added, and then I'll be ready to put the top together. I'll figure out borders when I get that far...have to balance all that black! This week I tried out one of my new pantographs, and I love it! 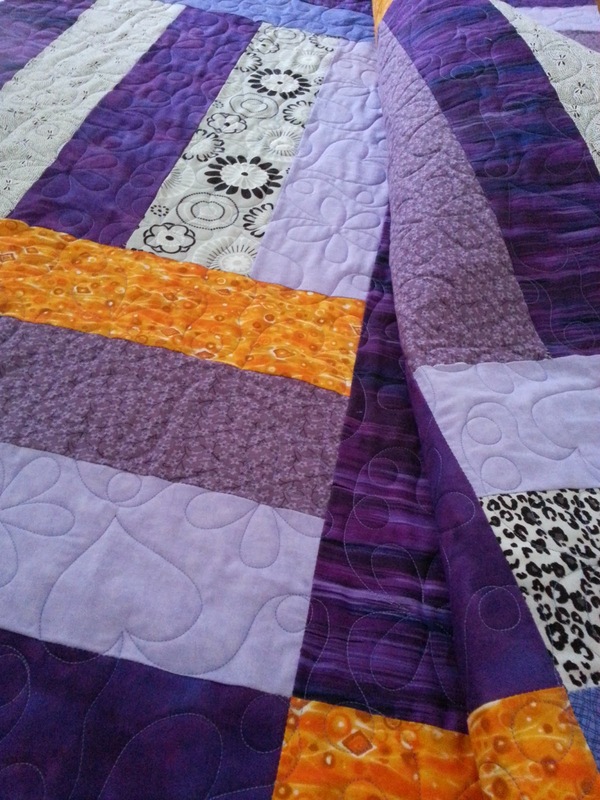 This is K's first quilt, and I think it turned out beautifully. The shots of orange make it sing! 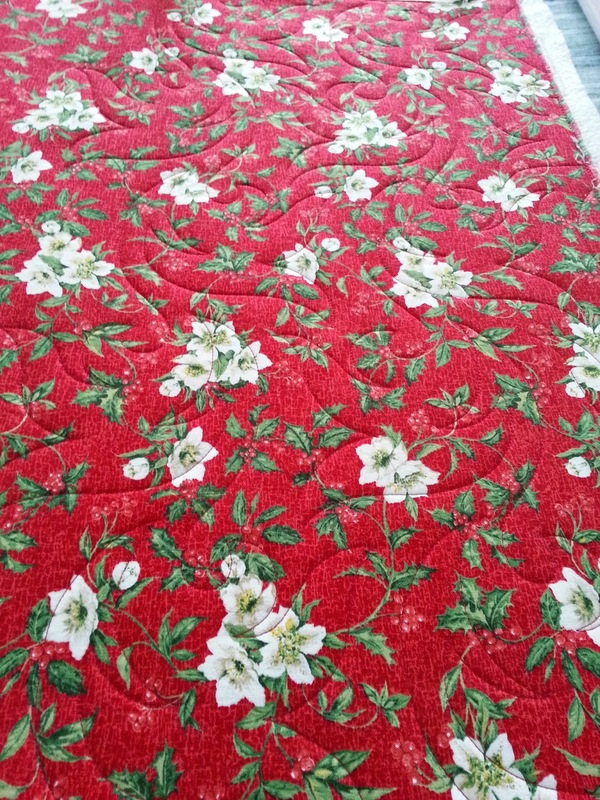 One of the quilted fabrics that will be made into runners. 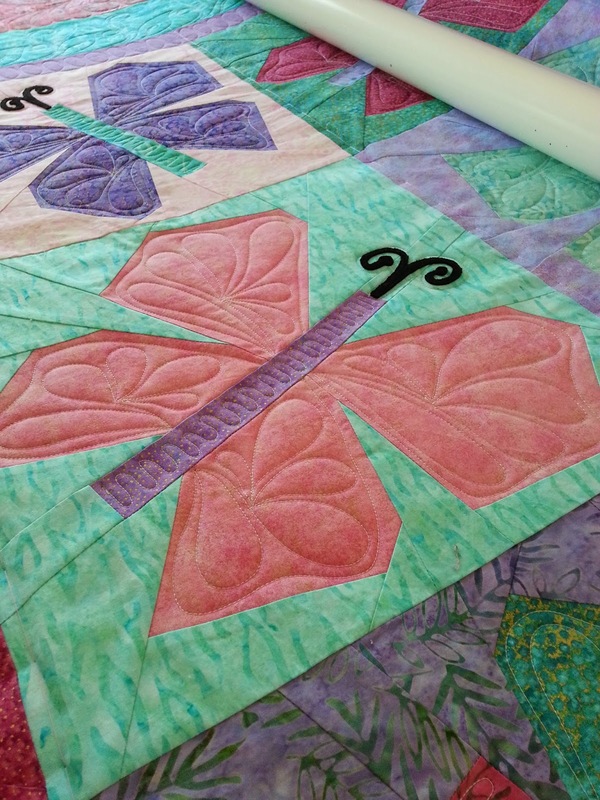 On the frame today is a Buggy Barn butterfly quilt. 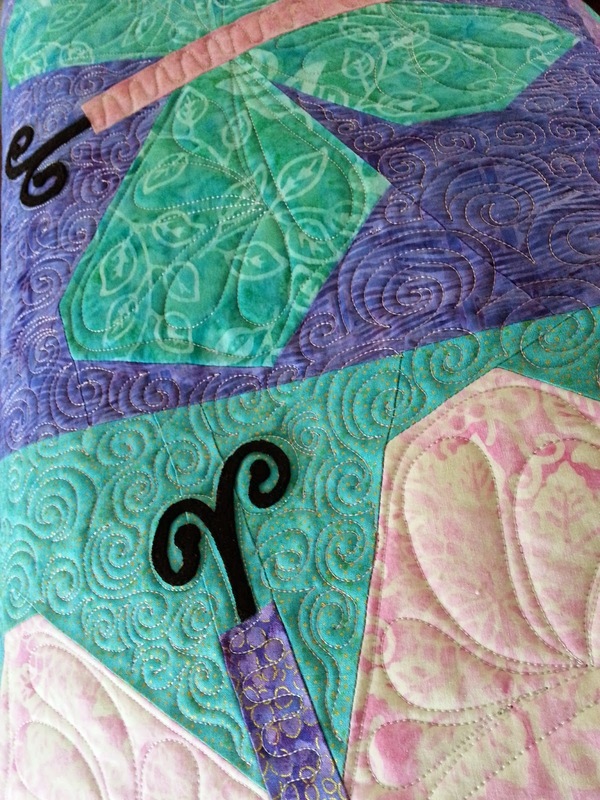 Deep, whimsical feathers in the outside border will tie in with the filler planned for the butterflies. 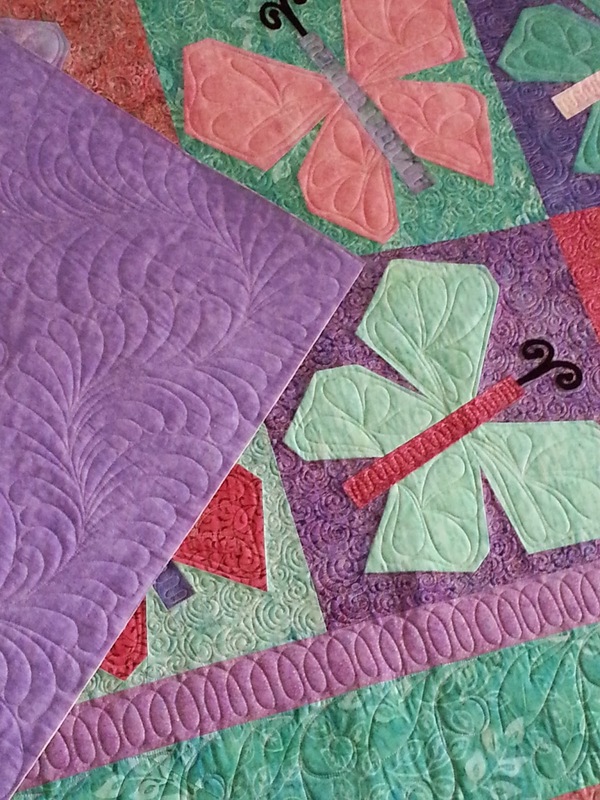 Loops in the purple border are a nod to the way butterflies flit in their dizzying dance. Grass and leaves add interest to the green border without being overpowering. Sometimes it's good to have a bit of breathing room. 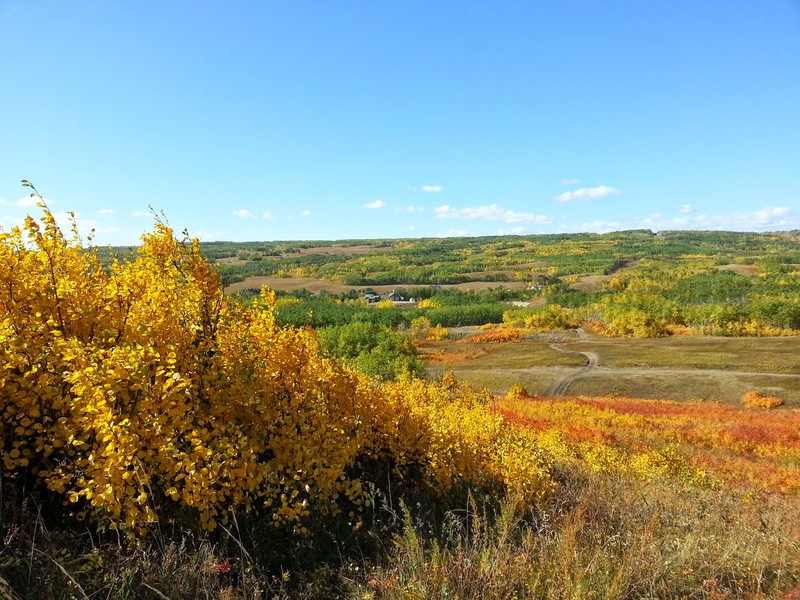 Reassessing goals and allowing breathing space for myself is also a good thing. Extra time with a project is okay. Cutting back production is okay, too.